While Alexa Enabled Devices can give you weather reports and forecasts natively, you may want to get additional information that is not normally available in Alexa's default weather report. Using these reports, you can get the current weather (including items like UV index and precipitation) along with today's, tonight's or tomorrow's forecast, either individually or all in one report. In addition, you can also find out the sunrise and sunset (or moon rise/set) for the location in your SmartThings account (or optionally, from another zip code you designate). Finally, you can also get the lunar phases and tide information, if you are interested in that data, along with the option of expanding any weather advisories that may occur. To begin creating a weather report, find the Ask Alexa Extensions are on the main Ask Alexa menu, then click Weather Reports. You will find a green + sign labeled <<Create A New Weather Report>>. A screen as shown below will open. First, simply input a name, along with assigning any aliases you want to that report. Below name input area is <<Weather Reporting>>. 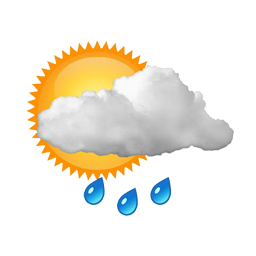 This area allows you to set up the weather output to include either the current weather or the weather forecast. Options for each of these areas are outlined below. In this area you have three options: Today's forecast, tonight's forecast and tomorrow's forecast. Not much to configure on this page, but you can choose any of the three selections (or all of them) and they will play in order from soonest to latest. As the name implies, you can turn on or off the announcement of the sunrise and sunset for the area designated in the zip code area. Please note the reports are day centric. That means if the sun rose at 7am and you run this report at 9am, it will report THAT day's sunrise, not tomorrow's. Same thing with sunset. The lunar rise/set has the same day-centric configuration as the sunrise/sunset. That means if the moon rose at 7pm and you run this report at 9pm, it will report THAT day's moonrise. Regarding advisories, please see Ask_Alexa#Weather_Reports_and_Advisories for a practical use case that allows for you to break up your forecast and call advisories directly. is an undocumented feature, but may give you more specific information that just a zip code. Then click on "change station", and you'll get a map with several nearby stations to choose from. The PWS ID is listed in parenthesis next to the location name in the list. %forecast% Good Night, sleep well! This assumes you have a weather report named "Forecast". This would append the report with the "forecast" report, and then say "Good Night, sleep well!" Another option is to run the Weather Report as part of a group of and Extension Group(see Ask_Alexa_-_Macros#Extension_Group). Finally, weather reports show up and playable as flash briefings. If you wish to not only output the real time results to Alexa, but to other speakers in the house, and SMS number, or even to a push location you may output the results to the Ask Alexa Message Queues. See Ask_Alexa_-_Message_Queues for more information. Just like macros, you have the option to restrict when the weather report activates. 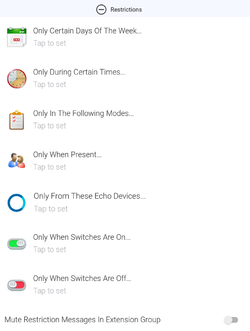 These include restrictions based on the day of the week, time of day, which mode you are in, whose presence sensors are 'present', which Alexa you are speaking to or which switches are on or off. These restrictions, by themselves, may not be very useful on their own; however, when used with extension groups, the responses can be more 'dynamic', possibly playing different weather reports based on the the day of the week. Please remember ANY changes or additions you make to your Ask Alexa environment should immediately be followed up with running <<Settings>> <<Setup Variables>> in the main Ask Alexa SmartApp. This will allow newly created weather reports to be reflected in the Amazon developer site. See Ask_Alexa#Setup_Variables for more information. This page was last edited on 16 March 2018, at 09:04.